Carrie Bell Jackson Bizzard, 95, of Savannah, Georgia and widow of Luches Bizzard, died Sunday evening, February 10, 2019, at her home. Born in Mt. Pleasant, Georgia, she was a daughter of the late Willie Henry Jackson and the late Alberta Buggs Jackson Singleton. Mrs. Bizzard was a charter and active member of New Covenant Seventh-day Adventist Church. She was a homemaker. In addition to her husband and parents, she was preceded in death by a daughter-in-law, Sara B. Bizzard; three sisters, Mildred Williams, Barbara Ann Johnson and Marva O. Feurtado, and two brothers, Archie Jackson and Willie Jackson. Surviving are one daughter, Erica Bizzard Grant and her husband, Alphonso, of Savannah, Georgia; two sons, Abdul A. 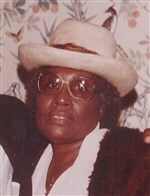 “Dean” Fard-Bizzard of Atlanta, Georgia, and Atif Abdul Fard-Bizzard of Savannah, Georgia; one sister, Jackie Miller; four brothers, Ernest J. Jackson, Donald Singleton, Dwight Singleton and Alonzo Singleton; nine grandchildren; twenty-five great-grandchildren; a number of nieces and nephews; her goddaughter, Lois B. Shields and her husband, Tom, and a special friend, Erma B. Seabrooks. The funeral service will be held at 11 o’clock Monday morning, February 18, 2019, at Savannah West Broad Seventh-day Adventist Church – 2501 Martin Luther King, Jr. Boulevard. Interment will be in Hillcrest Abbey –West. My deepest heartfelt condolences. May you find comfort, love and peace.